Artwork for new single, "Plans of My Own"
The "new" song, recorded in 1996, was released on November 18, 2016. Listen to clip or buy song at Amazon: here. Also at iTunes here. What could be better than Gordon Lightfoot fingerpicking on his 12-string singing a never released tune? Before we get to that answer, here's the great news. 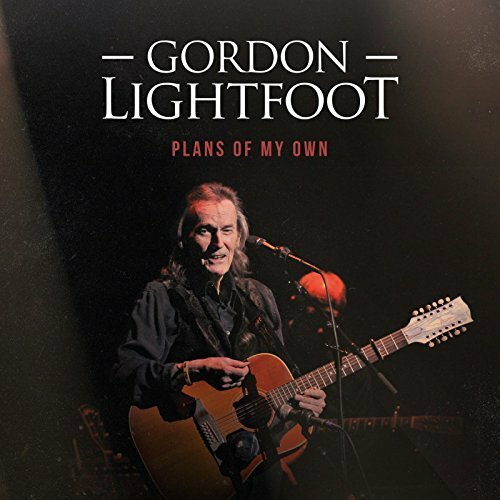 On November 18, Warner Records, Lightfoot's longtime home, releases worldwide "Plans of My Own" - the Canadian legend's first unreleased track in 12 years. I had the privilege of hearing it this week - and it is wonderful. The song features a beautiful melody melded with poignant lyrics – classic Lightfoot. It reminded me of an early Lightfoot work , "16 Miles (to seven lakes)" — which was released 50 years ago — and "Morning Glory," from the East of Midnight collection; two of my favorites. The new tune comes amid sad news in the world, including the recent deaths of fellow Canadian legend Leonard Cohen and American musician Leon Russell. So it is interesting that "Plans" see Lightfoot reflecting on his life with haunting lyrics, more relevant than ever. Tells me there are things to be set right," he starts. But until that time, he explains, he's got "plans of my own." All I have to show, is the smile upon my face." It ends with the promise – "I will travel anywhere to be right where you are." The history of the song is also fascinating. "Plans" was originally recorded in 1996 as part of the "A Painter Passing Through" sessions. Longtime Lightfoot producer Bob Doidge recently re-discovered the track while going through old tapes at his Grant Avenue Studio in Toronto, according to reports. Fans should note that "Plans" is available from digital retailers and music streaming sites. So back to the question posed at the top. Perhaps the only correct answer is: another release by Lightfoot with his incredible band.